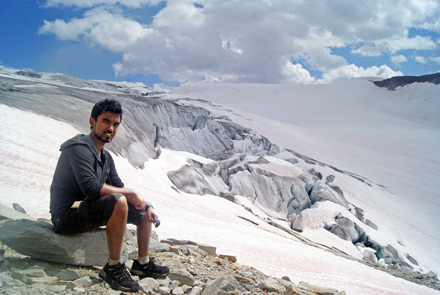 "Living in big cities all throughout my life, I seldom had a chance to be close to the nature," writes Saleh Ewan, currently enrolled in McGill’s Mining Engineering Co-op Program. Ewan had his chance this summer during his internship at Teck Coal Ltd. in Fernie, B.C., where he spent most of his downtime climbing mountains and getting up close and personal with any number of four-legged creatures. 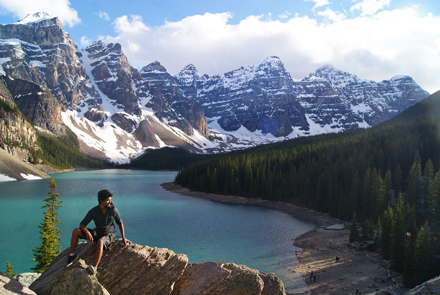 Saleh Ewan takes in the magnificent view of Moraine Lake in Lake Louise, AB. / Photo: Saleh Ewan. Mining Engineering Co-op term… to many it conjures up a job in the middle of nowhere, working underground in the dark; away from civilization. However, for me that was far from the case as I found myself literally on top of the world. In summer 2013, I was hired by Teck Coal Ltd. for a Mining Engineering co-op term in British Columbia. I worked as a Mining Engineering Co-op student in their Survey, Geology and Geotechnical Departments. I worked at an open-pit coal mine on top of the Rocky Mountains. Each day as a Mining Engineering co-op started with morning meetings with engineers and geologists. After that I would manage and cost-track exploration projects, update weekly maps for the mine or go out with geotechnical engineers for spoil monitoring. Working in the mine and working with the people in the mine certainly provided me with some priceless experiences. I had a very cooperative supervisor, who would do her best to include me in as many business-related activities as possible. All the information, mentorship and lessons I have received from my supervisor and co-workers at Teck have nurtured me to become a better future engineer. As I am an international student from Bangladesh, I was very excited to be working in B.C. for my co-op term, as it gave me a huge opportunity to explore more of Canada. I drove from Montreal to B.C., a total distance of 4,000 km, which was a great way to explore many major cities of Canada. On May 4, I started my journey early in the morning from Montreal with my girlfriend. Our target was to reach Sault Ste. Marie, Ont. by the end of the day. On our way we stopped at Ottawa and spent some time at the Parliament building. We also made a quick stop in Sudbury to check the famous mining city. We reached Sault Ste. Marie around 10 p.m.. The next morning we woke up early and walked around the town. Sault Ste. Marie is a small, beautiful town on the Canada-U.S. border. After breakfast at Tim Hortons we started our journey again. This time we drove around Lake Superior and stopped at Thunder Bay for the night. The next day we stopped at a town called Kenora, a picturesque town surrounded by lakes. The town is so beautiful that we wanted to stay there for days, but unfortunately we only spent few hours there as I had to be in B.C. by the end of fourth day. In the evening of third day we finally crossed Ontario and reached Brandon, Manitoba. The next day saw us log 17 hours on road, driving through Manitoba, Saskatchewan, Alberta, finally reaching B.C. at 11:30 at night. The journey was long and tiring, but I enjoyed every moment on the road driving across Canada. The lakes in Ontario, the vast open fields in Saskatchewan, the prairies in Alberta, and the Rocky Mountains in B.C. all proved to me that Canada is truly a place of natural wonders. During my stay in B.C., I lived in a small town called Fernie which is located in a valley surrounded by the magnificent Rocky Mountains. I lived with roommates who were also from McGill and were working as interns in Teck. Our house was in front of Elk River and every morning I would wake up to the scenic view of river and mountains through my bedroom window. Fernie is famous for its world famous ski resort and hiking/camping spots. People there live an active lifestyle, which influenced me to a great extent. I, along with two other co-op students, hiked in and around Fernie during much of my spare time. Believe it or not, we did fourteen hikes, hiking every weekend, throughout the season! Cobalt lake in Bugaboo, Perley rock in Glacier National Park, Polar Peak in Fernie, Turtle Mountain in Alberta, Crowsnest Mountain in Crowsnest Pass, Three Sisters Mountain, Crypt lake in Waterton Lakes National Park are few of my favorite hikes that we did this summer. Portable chicken wire fences: The best way to keep pesky porcupines from chewing on tires and rubber brake lines of unattended cars. / Photo: Saleh Ewan. Getting to the trailheads of these mountains were a challenge too. Most of them don’t have a good access road, which meant we had to drive on bumpy gravel roads much of the time. 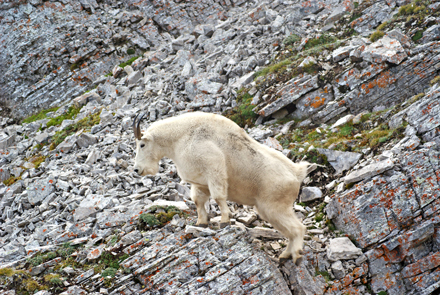 One particular hike that had really bad access road was Bugaboo. I had to drive my small 2004 model “Mazda trois“ 50 kilometres on a narrow gravel road with logging trucks coming from the opposite direction. And that is not all. 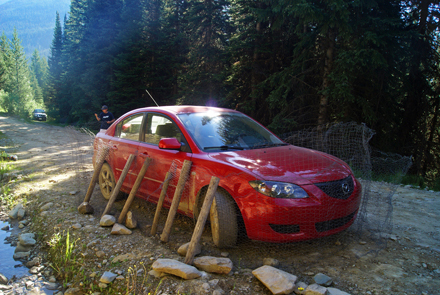 After reaching the trailhead we had to secure the car with chicken wire so that porcupines wouldn’t chew the tires and rubber brake lines! Living in big cities all throughout my life, I seldom had a chance to be close to the nature. Given this chance, I became a fanatic to face the challenges those mountain activities offered and craved for more. 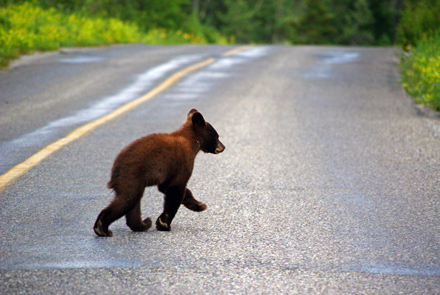 Not only this, I also had a chance to see all sort of Canadian wildlife, including grizzly bear, black bear, mountain goat, moose, bighorn sheep, elk and many more. Not only did all this provide me with a perfect work-life balance, it also helped hone my photography skills as well! I clicked numerous pictures of wildlife, amazing lakes and waterfalls, and the spectacular views atop mountains. Looking back at those days I spent out West, I definitely miss the active lifestyle, the mountains, the workplace and the friends I made. People sometimes ask me if I enjoyed my stay in Fernie, away from all the diverse activities of city life? I tell them that I most certainly did and that I hope to go back to that wonderful place again someday! Saleh Ewan is currently enrolled in McGill’s Mining Engineering Co-op Program. He is an International student from Bangladesh. He started his studies at McGill in 2009 and is expecting to graduate in December 2014. His experience includes providing IT related service at McGill ICS Center and working as a mining engineering co-op student at Teck Coal Ltd. in British Columbia.